Today's big names and a few throwbacks didn't disappoint. 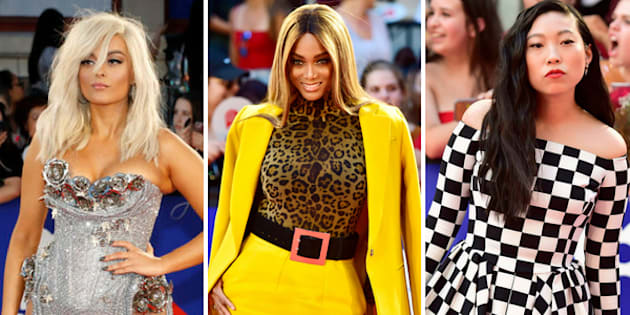 Bebe Rexha, Tyra Banks and Awkwafina on the MMVA red carpet in Toronto on Aug. 26, 2018. Let's be honest: one of the best parts of any awards show is the red carpet. Seeing all the outfits and hearing all the pre-show banter is sometimes more fun than the performances or the speeches, right? This year's Much Music Video Awards, which have now officially been rebranded the iHeart Radio MMVAs, includes some big-name celebrities ("Crazy Rich Asians" star Awkwafina, teen heartthrob Shawn Mendes), some Canadian staples (Alessia Cara, Brett Kissel) and some blasts from the past (98 Degrees! Really!). Here are the most memorable outfits from Sunday night's show. Awkwafina, who told red-carpet reporters she prepared for hosting duties by "eating chicken tenders," looked great in a black-and-white checked skater dress. Fresh off last week's MTV VMAs, Canada's own Shawn Mendes went for a subtle paisley print shirt. Shawn Mendes takes a selfie with fans. Sprinter Andre De Grasse chose a multi-hued camo print. Sophie Hawley-Weld of Sofi Tukker wore what you could call a pant and crop top, but would more accurately be described as a lottttt of green tulle. Musician, actor and fan favourite Wu, formerly a member of K-pop band EXO, chanelled the timeless vampire Lestat in his Givenchy suit. Here's Hamilton, Ont. band Arkells, looking dapper in plaid and a well-tailored motorcycle jacket. Hamilton, Ont. ban Arkells, looking dapper. Her wide-legged pants and matching crop top are sophisticated, but still fun. Meghan Trainor opted for a floral-textured all-white ensemble with an "I Dream of Jeannie"-inspired ponytail. This outfit is definitely what the kids call "a lewk." We tried to capture Tyra's yellow-and-leopard print outfit in words, but we could never describe it more effectively than she did. Alberta country singer Brett Kissel has an extremely strong jacket game.